Moisturize like a Pro! Welcome to the world of Professional Daily Hair Moisturizers. Aveda Daily Hair Repair | Nexxus Leave In Moisturizer | Philip Kingsley Daily Damage Defense | KeraCare Oil Moisturizer | Paul Mitchell Instant Moisture Daily Treatment. Some of us have made worth while investments into professional quality deep conditioners, masks and treatments in search of perfectly healthy hair. Once we fork out our hard earned cash for pricier products, we expect to receive high quality ingredients and amazing results in return. Over the years, I've found many wonderful staples because I've stepped out of my comfort zone and invested in higher quality. Now my curiosity leads me to explore the world of daily moisturizers from professional brands. In my search for the "pro-moisturizers". I realized that most professional brands just don't make a daily leave-in moisturizing product. Probably because their client base doesn't really use such a product on a daily basis. But don't you worry, there were plenty of brands who understand the need for instant moisture (and hair repair) day in and day out. This product has been a staple of mine for years. I'm not a fan of thick moisturizers for fear of product build up. This product is light, creamy and practically melts into my strands. I also appreciate the addition of quinoa protein (which has a low molecular weight) to provide a bit of strength. Because it's an Aveda product, this moisturizer is loaded with botanicals and extracts. Even if I add other moisturizers to my rotation, this Aveda Damage Remedy will always be a staple. After being blown away by Philip Kingsley's Elasticizer Extreme pre-poo treatment, I asked myself, "I wonder if they have a daily moisturizer?" Turns out they have a liquid daily-leave in to aid in elasticity, detangle, and help protect the hair during styling. In an effort to further boost moisture levels, I'll be experimenting with substituting water in my L.C.O regimen with a liquid moisturizer. This product just might be just what my hair needs. I love Keracare's Sulfate Free Shampoo. I adore their Humecto conditioner. I'm sure my hair will also fall in love with their oil moisturizer. Way back in the day, I used Motions oil moisturizer on a daily basis (and Luster's Pink Oil Moisturizer before that). Maybe Keracare's moisturizer is the next evolution of oil moisturizers. 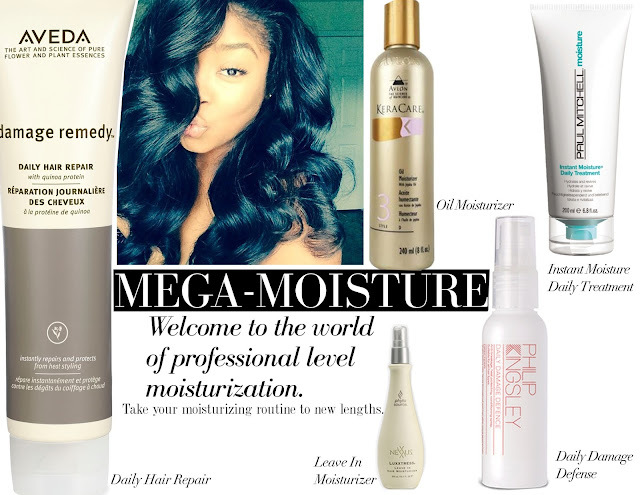 Oil moisturizers are perfect for when you need a heavier level of moisture (like when you are doing high manipulation styles). I love how the product already comes loaded with oil which can save time in having to layer/seal with oil. They're also great to travel with or to keep in your bag because one product usually does the trick. I've added Keracare's Jojoba Oil Moisturizer to my cart. Will review once I've had a chance to try it.